Tomorrow’s World proclaims to the world the good news of Jesus Christ’s coming Kingdom (Matthew 24:14; Mark 16:15), and blows a bold “warning trumpet” of God’s impending judgment, calling for repentance and spiritual change (Matthew 24:21; Isaiah 58:1; Ezekiel 33). We teach and practice original Christianity as taught and practiced by Jesus Christ and the original Apostles. Tomorrow’s World makes plain the Bible’s answers to the most important questions: Does God exist and how can we worship Him? Why were you born? What happens after death? What does the future hold? Tomorrow’s World provides real insight into the underlying causes behind today’s news headlines, but explains what will happen in the future, based on Bible prophecy. 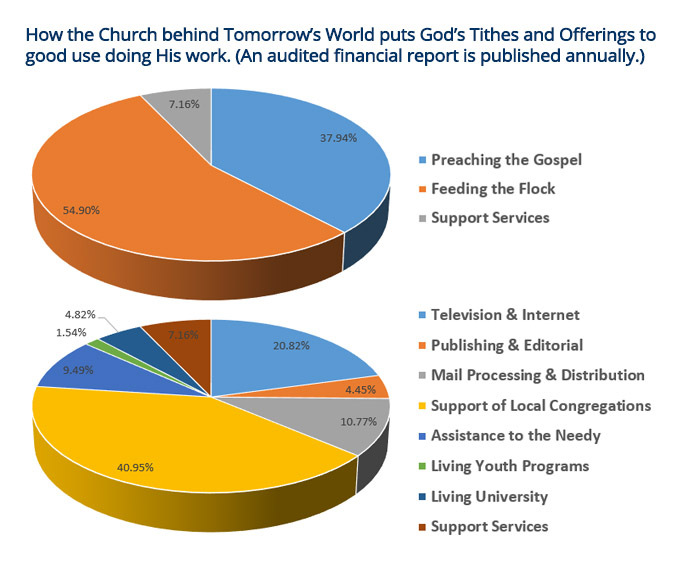 Tomorrow’s World is sponsored by the Living Church of God, with active congregations in North and South America, the Caribbean, Europe, Asia, Africa and Australasia, with more than 200 ministers serving over 350 congregations around the globe, under the leadership of Evangelist Gerald E. Weston, who was appointed in 2016 to succeed the late Dr. Roderick C. Meredith upon his death. Roderick Meredith was one of the original evangelists ordained in December 1952 by the late Herbert W. Armstrong. Mr. Gerald Weston and fellow evangelist Richard F. Ames, along with Rod McNair, Wallace Smith, Mario Hernandez and Yvon Brochu are broadcast over satellite, cable TV and the internet around the world to every continent in numerous languages. The magazine, booklets, and Bible study course published by Tomorrow’s World are made available without charge. This is made possible by the tithes and offerings of Living Church of God members, and others who have chosen to become co-workers in proclaiming Christ’s true gospel to all nations.